One of the fun things about candy history, and about product packaging more broadly, is that it’s something that isn’t very well documented. For me, that means I get to become a bit of a pop-culture archeologist, hunting for things and revealing things that a lot of folks don’t remember, or never even knew existed. 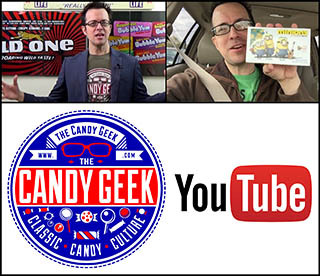 There isn’t too much primary research being done in the realm of pop culture, but with candy packaging and candy history, there is. For years over on Flickr, I’ve been endeavoring to track down items and share high-quality images of things that you couldn’t see anywhere else, and I’m continuing to do that in a different, more-focused way here on this site. Today is one of those special days where I get to reveal a piece of pop culture ephemera (and confectionery packaging history) to the world that most folks have never seen. 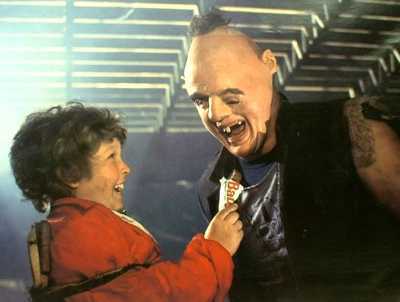 If you remember Steven Spielberg’s The Goonies, you may remember that the character Chunk befriends Sloth, partially through sharing a Baby Ruth with him. These guys love their Baby Ruths! When the film was released in 1985, Nabisco Brands was the company that owned the Baby Ruth and Butterfinger brands. Nabisco had acquired the brands of the Curtiss company some years earlier, though years later they would pass to Nestle. Most Goonies fans are well aware of the Baby Ruth connection to the film. What most fans probably don’t know is that after the film came out, Nabisco’s Canadian arm released a Goonies licensed candy bar, and it’s a cool one. It’s a strikingly beautiful wrapper that captures the search-for-buried-treasure element of the film. It also features Sloth, rather than any of the human characters (maybe they couldn’t get or afford the rights to any of the other actors’ likenesses – I’m not sure). I honestly don’t know any historical details about this bar, other than what the wrapper itself reveals. Until recently, I’d never heard a thing about the existence of this one, and from what I can tell there is not a single mention of it anywhere on the internet, not even a whisper or a distant recollection. With most oddball forgotten candy products, you can at least find a forum post with someone talking about them, but not so with The Goonies candy bar. This is one of those lost gems of the confectionery world, as well as of Goonies history. For now, we can at least be certain that it did exist. It is lost no longer, and Goonies fans can begin to wonder why this one never made it to their corner store. Do any of my Canadian readers remember this one? Or anyone else for that matter? If you do, please let us know by leaving a comment. This is everything I’ve got on The Goonies candy bar. I figure this is enough for today. I hope seeing this one blew some of your minds, as much as it did mine. See you back here tomorrow! This entry was posted in 1980's, Chocolate and tagged 1980's, 80's, Canada, Canadian, candy, Chunk, collectible, collection, collector, confection, confectionery, ephemera, Jeff Cohen, licensed, Nabisco, packaging, Sloth, Spielberg, Steven Spielberg, sweets, Truffle Shuffle, vintage, wrapper. Bookmark the permalink. 17 Responses to The Goonies had a candy bar?!? Never heard of this. I’ve got a Gremlins candy bar. It was a special bar made for the movie theatre concession. Dan, have you ever shared an image of the Gremlins wrapper? I don’t think so. I am pretty sure I can find it and take a pic for flickr. Jason, not only did my mind just blow up, but I fell out of my chair too. Holy Crap! This kind of find, and the fact that you so readily and excitedly share it is the definition of why I started a website. I think I’ve mentioned in the past that your flickr account is one of my big influences in terms of getting me to start digging through old magazines and share my memories and finds with the internet, but if I haven’t let me rectify that and say thanks again! That’s the same Sloth artwork from the Topps sticker card puzzle backs, and also used on one of the wrappers from that set. I think it’s even better than using the kids since that Baby Ruth scene is so integral to Sloth and Chunk’s bonding. Man, I love this wrapper! And what a good thing too, that they’d gotten the packaging just right. Cause once they added Sloth’s likeness, they never stopped making these things. y’know, Cyndi Lauper eventually crosses my mind, without fail, whenever I think of this movie. Wonder if the licensing came down to the two of them: hmm, Sloth? or Cyndi? Wow! Being such a huge Goonies fan an all, this made my day!!! One really cool, yet frustrating thing is how other countries get different packaging and even premiums and toys that we do in the States. Always fun to see what we miss out on. Thanks for sharing! I do remember the chocolate bar fondly and like the previous commenter, remember it as being my ALL time favorite chocolate bar. I would stick it in the freezer for a bit before eating it as it would make the marshmallow part extra chewy. I wish they would make it permanently and just give it a new name. It’s probably better for my waist line to have disappeared, lol. Good memories and still love the movie! I was wondering if anyone else remembered it. My husband who I grew up with had no idea it even existed. His loss….. They were a fantastic mix of chocolate and marshmellow with the peanuts and caramel – sort of like adding a marshmellow filling to a Oh Henry! bar. It was great to see one on here. My dad was the VP of a wholesale business, and Nabisco had a screening of the film at the Toronto Science Center prior to it hitting theaters. Afterwards, attendees were given full-size Goonies movie theater posters, Goonies chocolate bars, and another product being introduced at the time – Splitz gum. Splitz gum was thick, rectangular-shaped gum that had two flavors in one – strawberry-banana and lemon-lime – with one flavor in the center and the other one wrapped around it. Splitz gum failed to sell well and was discontinued after a short period of time. 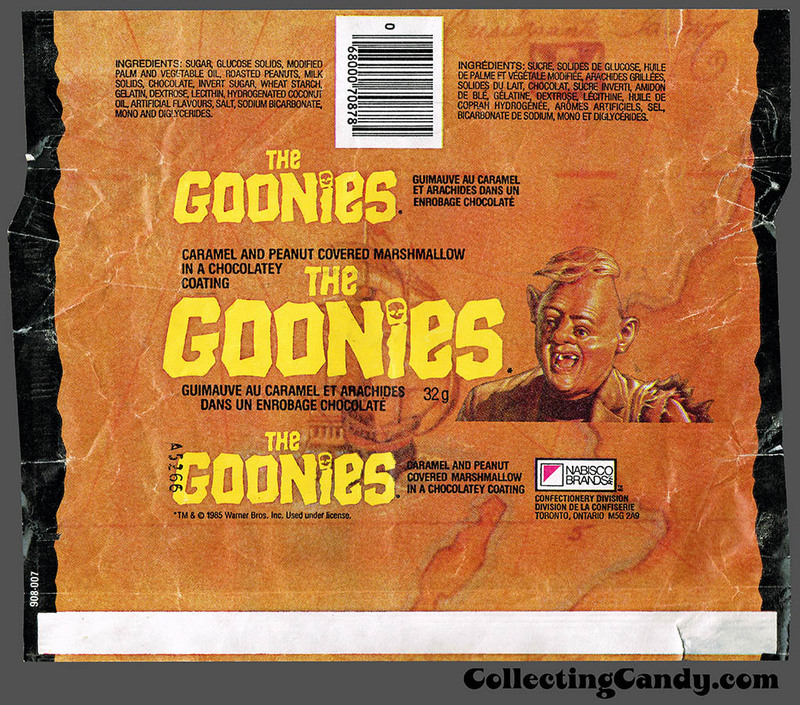 However, the Goonies chocolate bar didn’t fail, sales-wise, it was only ever intended to be manufactured/sold for a limited time as a promotion/tie-in to the movie’s release. The Goonies chocolate bar was really good, and I always wished that they had re-branded it after the promotion ended and continued to sell it. Sloth was a big character after the movie came out, I would have no doubt that was why he was the character chosen. I was a big Goonie fan when I was a kid and remember a lot of the movie promotion, and the craze. I Own a Script written just before the final draft. The candy bar in this script (prior to final screen play script “was their first written choice”.. And it wasn’t the “baby ruth”. The final script after mine (draft-revised script) in the final print it was “Changed to the Baby Ruth” . The candy bar in my script, was to be the candy bar before last revised then the screen play finally to film. Alot of people don’t know the original candy bar the writter used in his script writing for that particular scene. Sloth was to also “repeat” as he did with the baby ruth” this other candy bar. Yes! I vividly remember this candy bar. I grew up in London, Ontario, and I remember seeing this bar at the old Covent Garden Market there. I would’ve been 6 or so. Incredible that you have the wrapper!! Great stuff. I was born and raised in Manitoba in 1979, so like Ian above, I would’ve been about 6 at the time. I didn’t know much about the movie (pretty sure I never saw it in theaters and only discovered it on TV after the fact) but I definitely recall those Goonie bars at our local grocery store. I couldn’t remember a lot about the wrapper – I thought it looked a bit different than your pic, and while I know Sloth was featured prominently, I seem to have wrongly remembered it including other characters as well. Don’t know if I ever actually ate one, but knowing what I know now about the makeup of it, I wish I had…they sound delicious. I had no idea it was a Canadian exclusive. I feel bad for all the fans who missed out on them and have to think it would’ve been a big hit everywhere. Where did you acquire the wrapper, Jason?